Barre Chords are the same as Open Chords, in that they contain any amount of three or more different notes. The difference is that Barre Chordsdon’t make use of any open strings. With these chords, your first finger will do the same job as your guitar’s nut, and your other fingers will play notes above it. One reason for this is to play chords that simply wouldn’t exist in the open position, (without using an alternate tuning, that is). You may also choose to use Barre Chordsto achieve an alternate voicing of a chord, or because it’s more suited to your genre. For instance, you’re more likely to play Barre Chords in a reggae or indie outfit, as the longer decay produced by open strings is not really wanted – you’d want a short, sharp and staccato sound.Barre Chords allow this. The thick, grey line here represents your first finger – the Barring finger. This is the one which is now doing the job of your guitar’s nut. The coloured dots along this line are the notes you should be hearing. The number next to this line indicated what fret you are barring on. When playing these, be sure that your first finger is pressing down on the strings, hard enough that each note clearly rings-out, without any fret buzz or premature decay. 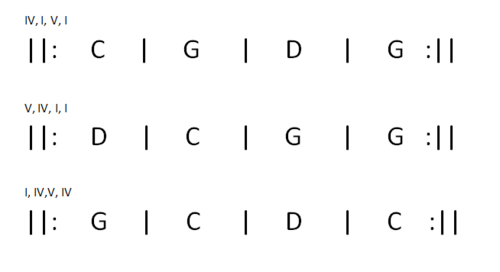 Also, try to think about how similar these shapes are to the Open Chords. The Maj chords rooted on the E string are the same shape as the EMaj, likewise with the Min shapes and Emin. Similarly, the chords rooted on the A string are the same shape as AMaj and Amin. These are Moveable shapes. This means that, provided you keep the notes in that order, you can move them freely up and down the neck. Once you’re happy with these chords you might want to try using them in between open chords, which you should already be comfortable with. Example Song #1 would be a good place to start.